The strength of the open Internet is the ability of its users to shape the Web itself and thereby shape society. Like society, the Internet grows stronger with every new voice. But there are many barriers that prevent the full diversity of the world from being reflected online. More than half of the world is still without Internet, and even people who do have access may be limited by factors like high cost, unreliable connections or censorship. Language is also barrier, since Web content is predominantly in English, even though people who don’t speak English outnumber those who do. There are other ways technology is skewed to reflect the unconscious biases of their creators thanks to years of inattention to diversity. Take for instance, how algorithms can perpetuate racial stereotypes in targeted advertising, or how languages like Hindi, Urdu, and Bangla are difficult to type on a standard computer keyboard. Today, over three billion people are online. There are now more Internet users in emerging economies than in developed economies, which is a big step towards increasing the diversity of voices online. That’s worth celebrating. Mobile phones have put the Internet within reach of more young people, women and rural areas than ever before. Universal Internet access in Least Developed Countries by 2020 is one of the United Nation’s new Sustainable Development Goals. Countless policies need to change to get billions of people online in three years, but the fact that Internet access now registers broadly as crucial to development, or as a human right in some contexts, is progress. The free, crowdsourced online encyclopedia Wikipedia continues to be a free fountain of knowledge to the tune of 16 billion pageviews a month in 284 languages. Dynamic technology and innovation hubs communities in developing countries are expanding to develop online services and businesses that meet local needs. Despite great progress in Internet adoption worldwide, access is not equally distributed. People living in wealthier countries have far greater access, and it is well documented that Internet adoption is slower for women than men almost everywhere in the world. Lack of skills and awareness of why the Internet is valuable is one of the principle reasons people don’t get online. At worst, the Internet can reinforce and exacerbate existing inequities, divisions and discriminatory practices—and may even introduce new threats. Online harassment is a growing plague. Women in particular are targets across a range of platforms, as are minorities everywhere. This inevitably leads to mistrust and retreat from the Web – which in turn depletes diversity online and harms the health of the Internet overall. Several governments are trigger-happy about temporarily switching off all or parts of the Internet with reasoning ranging from national security, to cheating on school exams, but ultimately threatening human rights and causing significant economic losses. In 2016, there were 51 intentional Internet shutdowns in 18 countries, according to AccessNow. The obstacles in the way of making the Internet accessible and welcoming for all are numerous, and won’t be overcome by waiting. It will take sustained action. As more people come online, we need corporations, governments and civil society to work together to develop better broadband policies, and new business models for equitable access. We also need new practices and incentives for local content creation and visibility, and ways in which users themselves can play a stronger role in contributing to the Web, in whatever language, format or medium that is most locally relevant. And in response to the trolls, mobs and haters who undermine respectful civil discourse online, we need a combination of community action and technological solutions. Hatred, racism and bigotry can be stomped out online at least as well as offline. The goal of digital inclusion presupposes that being connected is positive. We all bear responsibility for ensuring this is true for everyone. Translation from English to local languages is one way of supporting the Web in becoming as diverse as can be. Half of the world is still offline. 3.3 billion people are online. That’s a lot, but we need more policies to bring rich and poor online affordably and in meaningful ways. People who only have mobile Web access, can’t as easily do things like write essays, apply for jobs, or other things that can influence economic growth. Big digital divides persist, especially in the least wealthy countries. Internet access is skyrocketing in some regions, but poor, rural and marginalized populations are least likely to benefit. Unless policies change fast, only 16% of people in least developed countries will be online by 2020. 58% of people in the world can't afford an Internet connection. “Affordable” is widely agreed to be less than 5% of GDP per capita for entry level broadband services, but even that is a steep price for the slow and unreliable Internet in many countries. Also, the lowest percentages of women online are in countries where mobile Internet costs the most. Only some of the top 9 languages for Web content (English, Russian, German, Japanese, Spanish, French, Portuguese, Italian, Chinese) correlate with the number of users. Most languages on the Web are underrepresented. 52% of all websites are in English, even though only 25% of the global population understands English. The percentage of content in English decreases only slowly now, but used to be as high as 75% of all webpages in 1998. When people can read, experience and create content in their own language, Internet health improves. Censorship is alive on the Internet. Internet freedom is in decline for the sixth consecutive year, according to democracy watchdog Freedom House in the US. Their 2016 report ranks the majority of 65 countries studied as either “not free” or only “partly free”. Nice article..!! Thanks for sharing this informative vine. to keep in touch with family and friends must be provided for free by the cities’ at a wide band and those bussiness internet providers because they charge for commercial. Keep up the good work, I read few posts on this web site and I conceive that your blog is very interesting and has sets of fantastic information. Ahaa, its great exchange with respect to this article at this place at this blog, I have perused all that, so now me additionally remarking at this place. I was suggested this site by my cousin. I am uncertain about whether this post is composed by him as no one else realize such point by point about my difficulty.You are great! Much obliged! Get instant help & support For Microsoft issue, call us at our customer care number 1-800-279-1380. We are one of the best trustable technical support services providers for Microsoft office users, we are gives Microsoft Live Support quick help with our technicians help, Our Microsoft Certified nearby Microsoft help number professionals will provide you with arrangements to solve your problems just call us our toll-free Microsoft service number +1-888-964-8356. The internet cost is being reduced day by day. Some of the countries offer internet free of cost to their citizens. Reduction in cost is resulting in new inventions as more and more people can afford the internet now and creates something new every day. The gadgets have become an integral part of our lives and digitization has added it more towards our dependence on the technology. Chinese is still on the web what about Hindi Still need to go along way to make the digital India. There is also map bias. 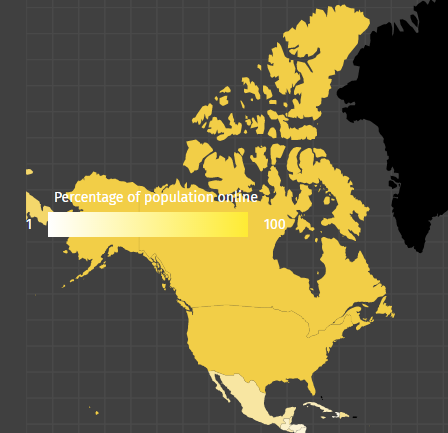 The map used in these graphics is the Mercator projection. It greatly distorts the size of land masses the further you get from the equator. For example, Greenland looks to be of equal size to Africa which is acutally 14 times great in area then Greenland. I would sugest using the Gall–Peters projection. Much better representaion of land area. How does this change the data? Exactamente. Como ciudadano d un país dnd con una riqueza lingüística inmensa (México), me duele ver cuántos idiomas se están perdiendo. Pero ésto no solamente está ocurriendo en mi país, sino en todo el mundo. Me gustaría ver algún tipo d esfuerzo para rescatarlas, o mínimo, documentarlas con el fin d no perderlas. Western Sahara is Moroccan . I love that most of the comments are by people with white-guy names talking like they are g*d d*mn world travelers that understand the intricacies of the English web-content issue. No one is blaming English speakers for anything, and you shouldn’t be blaming non-English countries for this problem either; the whole idea is to recognize the issue because a more diverse Internet benefits everyone. 100% of all the programming languages are based on English, and 100% of all the programmers understands English. There are tons of content are not allowed Search Spider to get it, such as WeiXin and TaoBao. I am sure, I am a Chinese people. There is nothing from stopping the Chinese from making websites or translating content. Chinese learn English starting in elementary school. They can read English websites just fine, I’m sure. The main reason this is important is because so many people claim that the internet provides universal access to all people, when this information displays that this is not the case. Not everyone is one the internet and their cultures are not all represented to benefit them. Therefore, the things that occur on the internet cannot be viewed as representative of the entire globe. You are in a hurry to take a print out of a file required for your crucial meeting. Once you opened the necessary file and tapped on the print button, you may not be able to take the print out. Might this have something to do with the restrictions that the CCP places on internet use? No, probably not. It’s probably that English supremacy is linguicist. Consider that the majority of languages of the world have no writing system. Should we say that the state of language is unhealthy? Generally, Internet costs money, it is not a necessity for survival. Therefore it is irrelevant in the scope of a poor person’s existence. Make the Internet cost nothing, and the time cost will still get in the way. Policy is not killing the spread of the internet to poor areas, economics is. You have to invest in people and develop some infrastructure for them to work in. Providing free internet would also enrich and educate the poor to enable them to a better life. I learn all kinds of things from the internet such as gardening and agriculture which would be important to the poor as a means to food and ways to be successful in that endeavor or building knowledge. The poor aren’t educated and being educated doesn’t mean you have to have a degree. So what’s stopping them from doing so? Nothing I’m aware of. Thanks, we’ll take a look at fixing.